This program focuses on visual art practice, critical theory, and art history. If you're seeking a specialized program in the practice of art, the BFA provides an excellent foundation in a variety of fields involving the making and understanding of visual art and contemporary aesthetics. The Visual Art program leading to the Bachelor of Fine Art allows you to select a Major or Honours degree. Both BFA and BA programs develop the creative and intellectual potential of each individual student through the practice and study of drawing, painting, printmaking, photography, sculpture, multimedia, and digital media. The BFA is designed for those contemplating a career in the visual arts and who seek a liberal arts education within a dynamic university setting. The Morris and Helen Belkin Art Gallery is the home of the UBC Fine Arts Gallery, and houses the university art collection & archive. What can you do with this major after graduation? Introduction to a broad range of contemporary studio practice. Intended for first year Bachelor of Fine Arts VISA students. Drawing on examples from across history and around the world, this course deals with the role of the visual in society, culture, and everyday experience. Development and history of contemporary art practice, with a focus on how artists realize and exchange ideas. Intended for second year BFA VISA students. Examination of current art practices and issues related to digital technologies and contemporary culture, with an emphasis on the theoretical conceptualization of digital artistic media. Development of a variety of techniques and approaches to painting. Emphasis on developing a strong paint vocabulary as well as acquiring knowledge of historical and contemporary issues in painting. Introduction to digital photography image creation in relation to contemporary art. Emphasis on digital camera use, file management, and digital print production. Only one of VISA 240 or VISA 241 may be used toward requirements for Major, Minor, or Honours programs in Visual Art. Contemporary sculpture practice and theory. Various sculpture materials and technologies including machinery use. Investigation of drawing as a discipline in the context of contemporary art and theory. Emphasis on self-directed projects in consultation with the instructor. Development of techniques and personal style in relation to ideas. History and contemporary issues in painting will be introduced to assist students in conceptualizing their painting practice. Exploring artistic practice through community-engaged partnerships and critical study. A seminar in problems in contemporary art practice and related theory. Preference given to Visual Art students. Self and community in the art and visual culture of modern Japan. Research-based studio with thematic or disciplinary focus. Intended for senior Visual Art undergraduate students. Readings in art theory and criticism. Advanced performance art practices and research methodologies. Relationship between artistic practice and media, examined through a history of paradigm shifts in technology. Exhibition course focusing on current curatorial practices and theories with an emphasis on contemporary visual art with the aim of preparing students to engage in the active organization of a large exhibition. Restricted to 4th year Majors in either VISA or ARTH, or permission of the instructor. A UBC education will introduce you to people and ideas from around the world, open doors to new opportunities, and take you places you never imagined. You’ll graduate not only with expertise in your chosen field, but with the skills you need to continue growing, learning, and evolving with your career over time. 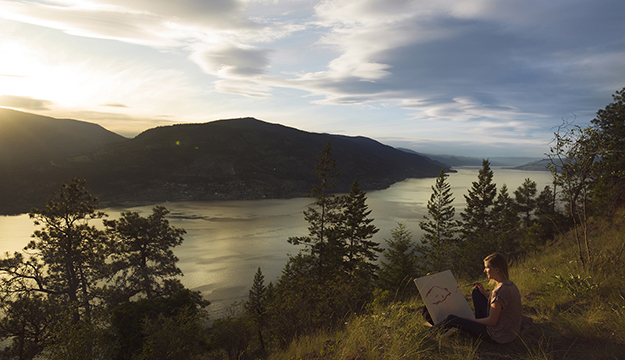 "I would describe UBC's Okanagan campus as a great place to develop into yourself. The interdisciplinary nature of the programs opens your mind to a multitude of concepts and I have seen many students pursue a different path than the one they started." Completion of the IB Diploma with a minimum score of 24 points, including at least three Higher Level courses and additional points for Extended Essay and Theory of Knowledge. Completion of Standard Level or Higher Level English A at a minimum score of 3, where English is the primary language of instruction.